Grant was 35 when he was gunned down in the bus terminus on Darling St. in the tough west end of Jamaica's capital. He was shot several times by two men who walked up to him in the very busy area, a spokesman for the Jamaica Constabulary said. 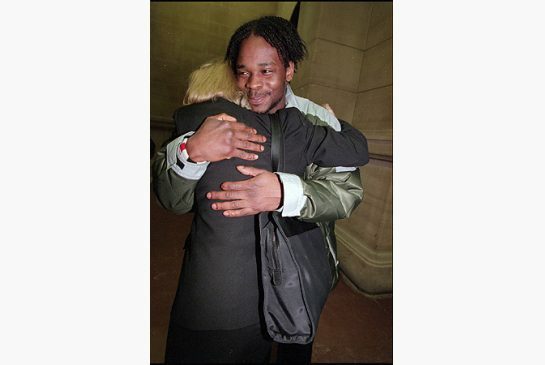 O’Neil Grant embraces defence lawyer Heather McArthur in January 2000. He called her every Mother’s Day. O'Neil Grant may get in death what he most wanted in life – to come back to the Toronto area and his three children. Grant, 35, the only accused to be acquitted in the slaying of Georgina "Vivi" Leimonis in what became known as the Just Desserts murder on April 5, 1994, was himself murdered last Monday in Kingston, Jamaica, where he was deported in 2001. Friends and family want to bring his body back here – his wife, three children, mother and siblings all live in the Greater Toronto area – for burial, said lawyer Heather McArthur, who with Peter Zaduk successfully defended Grant on the Leimonis murder charge. Grant's wife, who did not want her name used, said the family was hopeful they would be allowed to do it. "He called our daughter every night," she sobbed. "Now, after these nights without hearing from him, she is starting to realize she will not be hearing from him again." Grant was 35 when he was gunned down in the bus terminus on Darling St. in the tough west end of Jamaica's capital. He was shot several times by two men who walked up to him in the very busy area, a spokesman for the Jamaica Constabulary said. He was pronounced dead at the Kingston Public Hospital. An autopsy will be conducted tomorrow in Kingston. "We have not determined a motive, but we believe he was targeted," the police spokesperson said. "They went straight for him. This is an area used by thousands of people every day … the main bus station for the capital city." Grant's wife said she had heard that a gold chain Grant was wearing when he was shot was stolen, but the Jamaican police spokesperson said no motive had been determined for the slaying. McArthur still spoke to Grant regularly and said he also called her every Mother's Day and on the Dec. 11 anniversary of his 1999 acquittal. A group of friends here were trying to have him pardoned for the small-time crimes he was convicted of here, McArthur said. This would have allowed him to apply to legally return to Canada. A landed immigrant, Grant came to Canada from Jamaica at age 12. He was ordered deported in 1992, after convictions for assault with a weapon and possession of a narcotic for the purpose of trafficking, according to immigration records obtained during the trial. The only conviction after that was minor – passing a bad cheque. He appealed the order and in 1993 it was stayed for five years. Among the grounds for reinstituting the 1993 deportation order was that he failed to report his change of address between 1994 and 1999. This was the period he was in the Toronto Don jail awaiting trial, Zaduk said. Leimonis was 23 when she was struck by twin blasts from a sawed-off shotgun in the hands of Lawrence Augustus "Brown Man" Brown in the Just Desserts Café late on April 5, 1994. Brown was sentenced to life in prison with no chance of parole for 25 years, after being found guilty of first-degree murder. He was also jailed for 10 years concurrently for the robberies of the cafe patrons. Gary George Francis, who beat and abused the patrons as they were being robbed, was found guilty of manslaughter and robbery and sentenced to 15 years. With the credit he received for his five years plus in custody, Francis had to serve a maximum of eight years. He has been paroled for the Leimonis slaying, but is locked back up for another charge, Zaduk said. McArthur said a film about Grant's life was under way. "He had just re-signed a contract with the company for the rights to his life story, so he had some money. He would have been all right for money."